The PennVet Student Inspiration Awards are presented to two current PennVet students. The $25,000 award is designed to inspire ambition and reward enterprise, creativity, vision and talent. These awards encourage students to invent their future in veterinary medicine and provide opportunities far beyond those at any other veterinary school in the world. The Penn Vet Student Inspiration Awards recognize students’ potential to advance the frontiers of veterinary medicine and expand the profession’s impact on the well being of animals and society. GGD received the $25,000 award in both 2017 and 2018. View PennVet's press release from March 2017 here. The Global Health & Innovation Conference is the world's leading and largest global health conference as well as the largest social entrepreneurship conference, with 2,200 professionals and students from all 50 states and more than 55 countries. This must-attend, thought-leading conference convenes leaders, changemakers, and participants from all sectors of global health, international development, and social entrepreneurship. GGD was selected to compete for the $10,000 Innovation Prize in April of 2017 and reached the semifinalist round of competition. Learn more about GHIC here. Penn Abroad serves as the hub for student global opportunities at the University of Pennsylvania. Each year Penn Abroad sends more than 1,000 Penn students to more than 50 countries around the world on semester study abroad, summer internships, and embedded Global Seminars. The PennAbroad Global Internship Program (GIP) provides opportunities for students from various disciplines at Penn to intern or conduct research over the summer. These scholarships make unique experiences possible and help develop career and life-skills. The program also supports the interdisciplinary nature of GGD's efforts by bridging gaps between professions. GIP has committed USD $8000 annually to GGD's efforts, with USD $16,000 provided to date. Learn more about Penn Abroad here. The Student American Veterinary Medical Association (SAVMA) One Health Grand Challenge is​ an opportunity for students to develop a meaningful and sustainable project that addresses the intersection of human, animal, and environmental health. This competition is meant to challenge students to incorporate as many domains of One Health as possible while also having a far reaching audience. Projects will be judged based on quality and depth, concept clarity, and justification of how the work advances the mission of One Health. GGD was awarded $1700 in 2017. Learn more about the SAVMA One Health Grand Challenge here. The University of Pennsylvania School of Veterinary Medicine's Center for Animal Health and Productivity (CAHP) has awarded GGD $5000 to date. 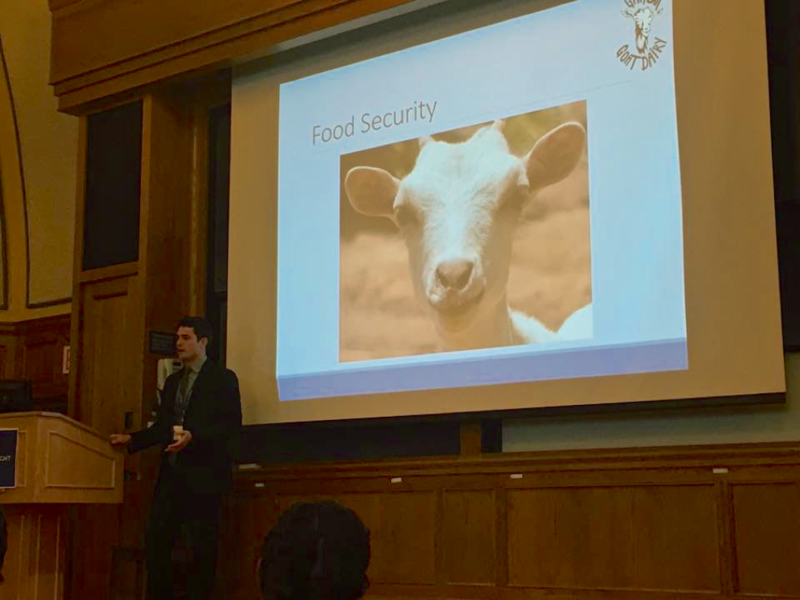 This funding promotes the international involvement of PennVet students in issues central to the achievement of global food security. Learn more about the CAHP here. The Paoli-Malvern-Berwyn Rotary Club awarded GGD $4000 in 2016 to complete our initial feasibility assessment. The club has also donated valuable advising and legal services throughout the pilot project's implementation phase. Learn more about the PMB Rotary Club here.